The HAMR-KS (Highly Adaptable Motor Retainers, Kwik-Switch version) system has been designed specifically for use with rocket kits or any scratch-built rocket using PML Kwik-Switch motor tubes. 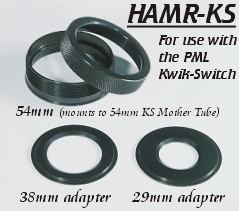 The basic HAMR-54 retainer is mounted to the Mother Tube for use with 54mm motors. Two adapter plates are supplied for flying with 38mm or 29mm motors. Changing from one motor size to another takes just seconds with no tools required!